The experiences of murdered victims of Nazi persecution perished with them. In this lecture, Gabór Tóth (University of Oxford, History) will discuss the ways text and data mining technology has helped to recover fragments of these lost experiences out of oral history interviews with survivors. He will also demonstrate how a data-driven anthology of these fragments have been built. He will begin the lecture by situating the challenge of uncovering lost experiences in historiography, and then demonstrate how text and data mining techniques have been applied to recover fragments of lost experiences from a big corpus of English language interviews in the collection of the United States Holocaust Memorial Museum, the USC Shoah Foundation and the Yale Fortunoff Archive for Video Testimonies. 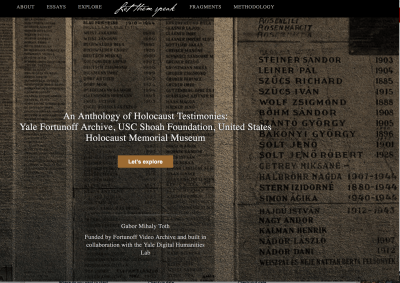 Gabór M. Tóth is a postdoctoral associate who has recently completed a dual fellowship at the Yale University Digital Humanities Lab and the Fortunoff Video Archive for Holocaust Testimonies. He earned his BA in Italian Literature and Language from Eötvös Lórand Science University, Budapest, his MA in Medieval Studies from Central European University, Budapest, and his PhD in History from the University of Oxford. His research interests include using computational linguistics, text and data mining for humanities research and the study of human cognition using historical documents. 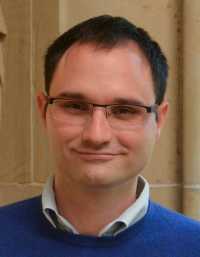 Tóth has won many awards, including a 2015 Visiting Fellowship at the University of Oxford’s Center for Humanities and the 2016 Gerda Henkel Fellowship in Digital History at the German Historical Institute in Washington, D.C. His work has been published in journals including Oxford’s Journal of Literary and Linguistic Computing, the CEU Annual of Medieval Studies and Fondazione Cini’s Studi Venezi. Tóth is also the founder and co-organizer of Hi-Cor, an interdisciplinary research group of historians and computational/corpus linguists at Oxford University. Refreshments will be served. RSVP to cagr@usc.edu.